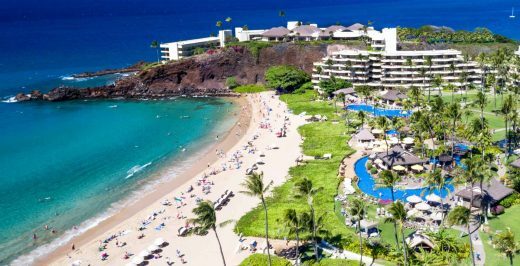 Sheraton Maui Resort & Spa, located on 23 oceanfront acres at legendary Black Rock on Ka‘anapali Beach, is the perfect destination for families this summer. The resort has kicked-off a number of activities and celebrations that the whole family can enjoy while making memories that will last a lifetime. Learn ukulele or hula, roast s’mores at the resort’s beachside fire pits, or partake in a Maui style clambake, complete with your own clambake bib. Sheraton Maui Resort & Spa is celebrating July’s National Hot Dog Month with a keiki hot dog decorating contest at the resort’s Hank’s Haute Dogs location on Tuesday, July 19 from 11 AM – 12 PM. Hank’s Haute Dogs Founder Henry “Hank” Adaniya will be on property to kick-off the event. Keiki will have the chance to create their favorite dog utilizing featured toppings and condiments from Hank’s Haute Dogs, including green relish, sauerkraut, dill pickles, diced raw. Maui onion, shredded cheddar cheese, mustard and ketchup, as well as Hank’s Haute Dogs signature items like beef chili, pineapple relish, mango mustard, spicy chipotle ketchup and curry ketchup. All keiki will use Hank’s traditional buns and Hank’s Frank all beef natural casing hot dogs as the base. The final dogs will be presented by contestants to a panel of judges led by Adaniya, with each entry evaluated based on presentation, taste and creativity. Not in town for the contest? No problem! Visit Hank’s Haute Dogs beachside location at Sheraton Maui and taste the restaurant’s eclectic menu of creative dogs, French fries and dipping sauces. Sheraton Maui Resort & Spa’s new beachside s’mores offering is the perfect way to end a beautiful day spent in Maui with family. Guests can choose to purchase one of two s’mores kits: traditional or local. The traditional kit, priced at $40, features all the favorites, with marshmallows, graham crackers, chocolate chip cookies, Hershey’s chocolates and Reese’s Peanut Butter Cups. The local version, priced at $55, embraces the flavors of Maui and includes Maui cookies, macadamia nut pieces, sprinkles, li hing mui sugar, bananas, pineapple, strawberries and a selection of chocolates, along with graham crackers and marshmallows. The resort’s fire pits are open nightly from 6 – 9 PM, and are located oceanfront right below Cliff Dive Bar. – families can have toes in the sand, s’mores in hand while enjoying beautiful views of Ka‘anapali Beach, and Lanai and Molokai in the distance. The classic summertime celebration takes place at the resort’s signature restaurant Black Rock Kitchen every Friday during summer. Summer Friday Clambakes offer an opportunity for families to enjoy delicious seafood, including clams, mussels, shrimp, snow crab claws, Portuguese sausage, corn on the cob and potatoes, while relaxing at Black Rock Kitchen’s outdoor terrace. Summer Friday Clambakes are priced at $38 per person (excluding tax & gratuity), and include one beverage. The special offering is available on Fridays during Black Rock Kitchen’s dinner hours from 5:30 to 9 PM. To make reservations for Summer Friday Clambakes, guests can call 808 662 8186 or visit www.sheraton-maui.com. In January, Sheraton Maui Resort & Spa partnered with Maui Ocean Center to develop an on-property Maui Ocean Center Hawaiian Marine Life Hale where individuals, families and keiki (children) can learn about marine life. Footsteps from Sheraton Maui Resort & Spa are one of the world’s top rated beaches and an underwater natural “amusement park” known as Pu’u Keka’a, or Black Rock. Pu’u Keka’a is home to many of Hawaii’s unique fish, invertebrate animals, honu (green sea turtles) and marine mammals. Resort guests and visitors of all ages are invited to learn about the vibrant marine life along the Ka’anapali coastline at the Maui Ocean Center’s hale, where a marine naturalist from Maui Ocean Center is present daily from 9 AM to 12 PM to interact with guests, talk story and answer questions. Interested in viewing and playing with animals up close? You can also visit Maui Ocean Center’s large aquarium in Maalaea with a $5 roundtrip shuttle from the resort! Interested in learning hula, ukulele, Hawaiian language, and more? Sheraton Maui Resort & Spa’s cultural advisor Jack Stone teaches guests about ancient Hawaii through traditions like coconut husking, taro pounding, bamboo stamping, lei making, hula dancing and ukulele lessons. Jack has a true love for Hawaiian culture and music. Guests will see him around property, strumming his ukulele, talking story with guests and visitors, and carting the “Aloha Wagon,” which he brings with him to conduct the resort’s cultural activities. Head to the resort’s Keiki Activity Hale and you will find Jack ready and waiting to share the spirit of Aloha with your family! Grab one of the resort’s Selfie Scavenger Hunt guides to discover 5 signature selfie spots at #sheratonmaui. Follow the clues to arrive at each spot, then upload your best selfie to your favorite social channels and tag #sheratonmaui or #sheratonmauiselfie! Have a favorite family photo spot that’s not on the list? Capture an image and upload with the resort’s hashtag for the chance to have it addedd to the scavenger hunt.